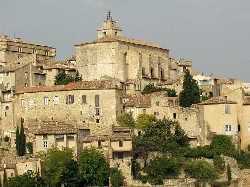 Arriving in the middle of Gordes, we are surprised by the large stately of the castle and the church who dominates the village. The castle built about 1031, has been rebuilt at 1525. Rebuilt carefully, he represent the architecture of middle age and “renaissance” his big towers (with terrace for the artillery) and his highs walls (bored about three floor about window “renaissance”). 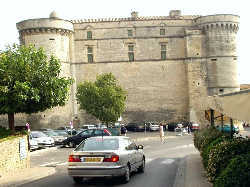 The walls, the towers and the “échauguettes”, behaviour any apertures for the canons and guns, to defend the castle. The south front confide in the sun, face at the ancient Gordes. Behind the fountain, an arching door breakthrough the wall, acceded to a internally space with a monumental stair. The castle contains an administrative center, and the “Musée Pol Mara”, Flemish contemporary painter, who lived in the village. 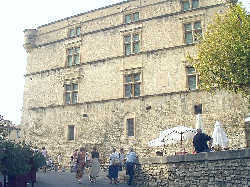 The “musée” can be visited in the chronological work of the artist. The visit finished in he honour room of the administrative center (the hotel de ville) with the last dreams and phantasms of the artist, under a monumental chimney built in the XVI ème age. The painters of Pol Mara shows often a lot off sensuality, desire and pleasers. 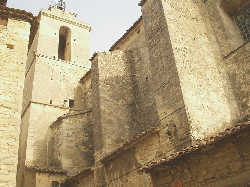 The church is in “roman” style. 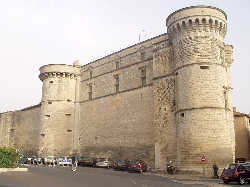 Built in XII ème age, she was dedicated to “Notre Dame”. At the XVIII age she was restructured and bestow at her patronising “Saint Firmin". We can see in “Clastres street” a shell , eyewitness of pilgrimages at direction about “Saint Jacques de Compostelle”.